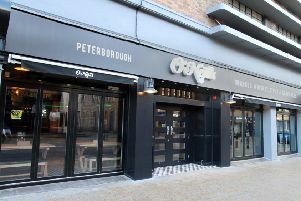 I had heard great things about Bill’s so I was looking forward to my visit to the latest addition to Peterborough’s burgeoning restaurant quarter. Located off St John’s Square in the building previously home to Lakeland the first thing to say is that the lay-out and look to the interior is fantastic. Hats off to the interior designer who has created a welcoming and vibrant space that feels cosy without being cluttered or cramped and lively without being raucous. We went at about 4.30 pm on a Saturday hoping to avoid what we imagined would be a later rush and to fit in with the needs of our toddler and baby. Our family got a friendly welcome. It was a bit of a tight squeeze with the pram and I made a mental note that at busy times this would probably not be the place for our young family. There were a fair few diners in and a lovely relaxed atmosphere. For starters I opted for Chicken In A Jar – chicken liver parfait with chutney and toasted ciabatta (£5.85). No complaints here, with a special thumbs up for the chutney that was tangy and fresh. My wife was not so lucky with her crab, chilli and prawn cakes (£5.85). They were dry, very brown on the outside, lacked chilli heat and were short on flavour. Our friendly waitress offered to bring our toddler’s meal at the same time as our starter which was helpful. She had burger and chips (£5.95) from the children’s menu. The chips were a big hit and the burger was okay . For mains my wife went for Bill’s green chicken curry with jasmine rice, squash, sugarsnap peas and chilli (£10.95). Now this did have the required heat, with a creamy coconut flavour. I went for Bill’s style BBQ pork ribs (£13.95). When my dish arrived I was worried I’d bitten off more than I could chew – it was a chunk of meat a caveman would have approved of. It wasn’t as tasty as I’d hoped – not dry, but not succulent either –and that goes for the accompanying slaw which was also on the bland side. I had no room for a pudding but mum went for the warm mini cinnamon doughnuts (£5.95) with chocolate dipping sauce and they ensured her meal ended on a high because they were delicious. Our toddler’s scoop of chocolate ice cream was also a hit and came at no extra cost. With a drink each, the bill came to £63.86, which, while competitive with the other similar Cathedral Square options, did not represent great value as overall the food was a notch under par. The bill also included a ‘‘discretionary optional gratuity of 10 per cent’’. This is one of my pet hates – if it’s discretionary and optional don’t put it on the bill. I asked for it be removed, which was absolutely no reflection on the service which was very good. This brought the bill down to £58.05. Perhaps my expectations were too high, but the overall experience was no more than okay and after having a few recommendations that was something of a disappointment. I will give it another go and hopefully next time the food will live up to the setting and the atmosphere.